Creating an online directory?? Here’s a list of some of the best Directory WordPress themes that you can use for almost any purpose. The list comprises of some very smart and feature-rich Directory listing WordPress themes. Directory WordPress themes are gaining more and more popularity because of their usability and boundless applications. These themes can be used for almost any purpose.Directory themes are another name for flexibility. You can decide what you want to do with it. 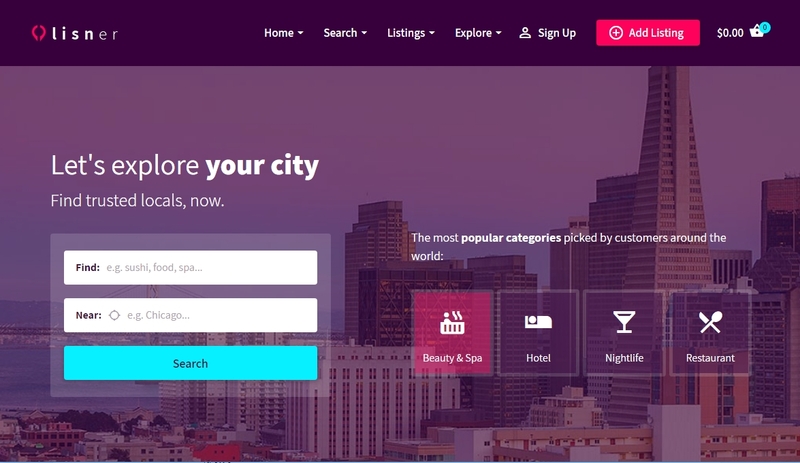 For example, the same Directory theme that allows you to create a website for your hotel can also be used to create a comprehensive directory that lists all the hotels in the region/state/country. The Directory platform is often looked upon as a monetizing opportunity. With the feature-rich platform, you can create and manage your online Directory website very easily. So that you don’t have to go and search different sites, we’ve put together the best available options for you. 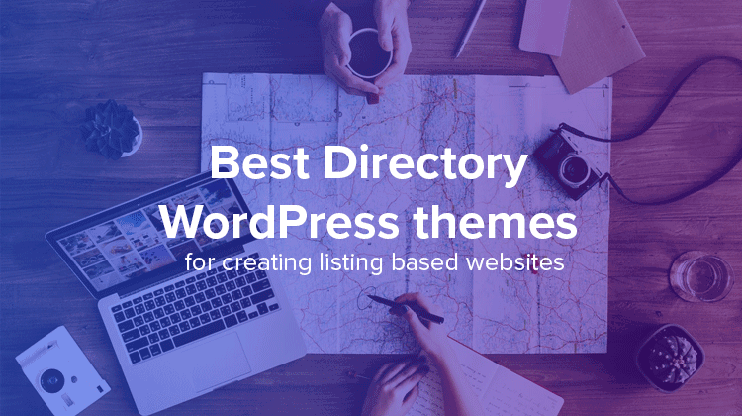 Read on to find out the best Directory WordPress themes of 2018 available on the internet. Alternately, you can opt for the self-hosted directory software platform, to create your online directory website in minutes. Want to start earning through an online location aware directory website. Here’s a complete guide on how you can create, manage and maintain a directory website on you own. Also get some valuable insights on how you can use various features of a directory theme to monetize your website. Whether it is a niche specific, or general (deeply categorized) directory website, this guide will help you through your website building. How to create a directory. Directory WordPress theme is your ultimate solution for creating online directories. This theme enables you to create online directories in minutes, without writing a line of code. The theme lets you create custom post types. Moreover, it comes with a fully functional front end submission system. Also, there’s a customizable front-end submission form that the users can use to submit their listings on your website. 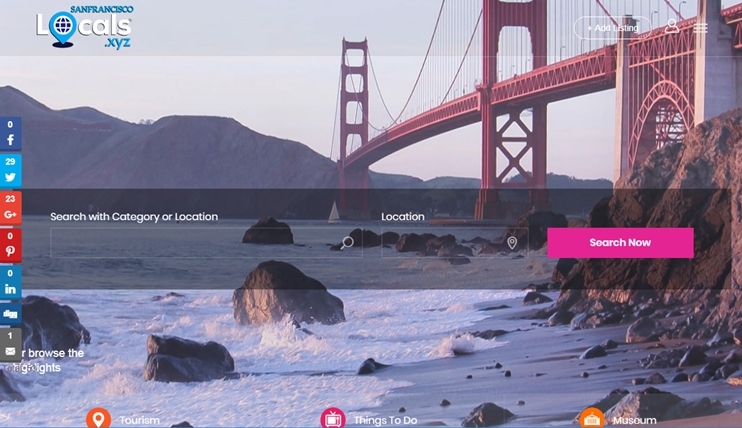 The theme comes integrated with Google Maps for all the location-based features. Besides, there are the filter and advanced search options to let the visitors find the listings of their choice in minutes. There are a number of ways through which you can make money through your online directory website created with Templatic Directory Theme. The directory theme is highly customizable and can be used for any purpose you can think of. Moreover, you can choose from the available Directory child themes for creating niche directory websites like hotel/restaurants directory, events directory, real estate directory, classifieds directory, job board, etc. Superlist is a multipurpose Directory theme. It has a responsive design. It comes with 12 predefined post types while allowing you to create a post type of your own. With the customization options set any color for your site. Like any other Directory theme, Superlist also allows front-end submission. The submission can be free or paid. The users will need to register to submit their listings in the offered categories. They can manage their accounts with a functional Dashboard. You can create unlimited custom price package and configure them. The users can subscribe to the package and submit the listings. The transaction logs can be viewed and the invoice will be displayed. The users can print the invoice if they want. The theme also offers coupon facilities. The coupon can be created from the front end. Superlist also has the feature to allow the users to claim the listings as their own. Superlist also has a listing slider that shows a slideshow of the listings of the site. Superlist is translation ready. You can create a website in any language using the theme. ListingPro is a directory solution that after a major upgrade is back with new features. The theme now have a super easy install and Auto Pilot submission. The theme has also included features as such Smart Search, Pricing Plans, Advance Filter, Claim and Verify listing, Checkout with the recurring feature. 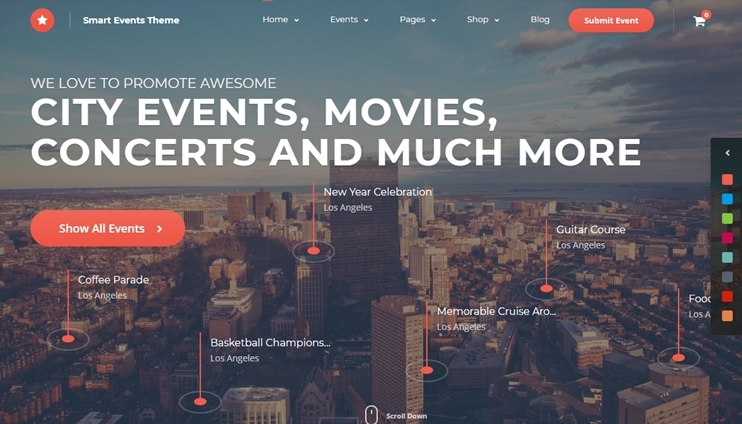 The theme have introduced new features as Events management where the business owner can now upload or promote the events. The theme include Deals and coupons which lets the llisting owner give unlimited deals and coupons to increase its sale. To scale the theme it also includes Adsense Ready to display ads and earn, the GDPR ready site, includes Auto-Locate and Location functionality. 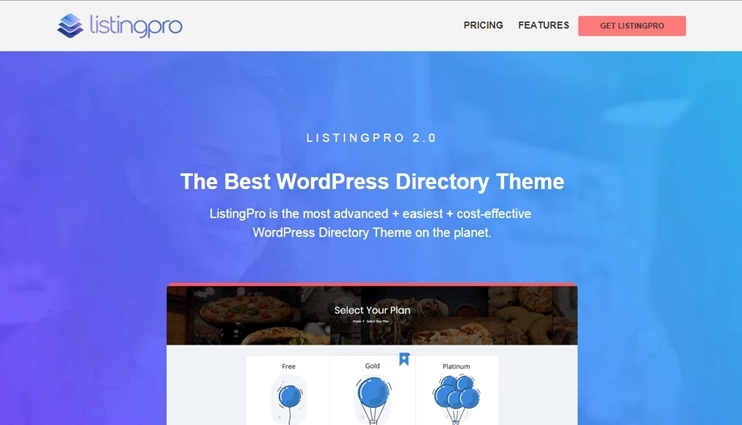 ListGo is a Directory featured WordPress theme that lets you create an attractive website based on it. The theme includes features as other WordPress theme of Recurring Payment option, Paid Claim listing. The theme has integrated the Facebook messenger plugin. The theme gives an option of Toggle form where you can decide which subscription members should get the contact form and which don’t. The theme also comes with integrated support of WooCommerce that lets you turn your directory website into something more. The theme has Timekit Booking form which likes Toggle form can be tied to a specific Add Listing plan. It now provides with the feature of Designing the Add listing page, you can disable social networks, custom fields on the Add listing page. The theme is now integrated with Stripe gateway for the ease of check out. Like other directory themes ListGo have also integrated the Auto location by Google with giving the user the functionality to create their own places. ListingEasy is exceptionally easy to use Directory WordPress theme for restaurants,cafes,hotels and many more.The theme is simple and no special coding skills are required.This ListingEasy theme is easy to setup with one click install and search functionality has been so easy that users can select the relevant filter and supports Multi Language functionality. The theme supports popular plugins like WooCommerce Booking for making an online booking for any hotels,WooCommerce plugin to show online store or products related to shopping,WP Job Manager plugin for job listings and generate a revenue using the Paid Listings Plugin.The can also design your own page templates using popular Drag and Drop Page Builder plugin Like Visual Composer. As the name suggests, Classiads is a theme for creating a classified directory website, that lets you post advertisements. There are two demos for Classiads - modern and classic, you can choose the one you like and install the sample data to make it look like the demo. Classiads has a beautiful and responsive design. The homepage of the theme can be managed by drag and drop options. You also have 5 header options for your site. Moreover, the Classiads comes with advanced theme options. change the colors and fonts easily with them. You can also use the font-awesome icons to make your site look more intuitive. For creating a valid and comprehensive Classifieds forms, there's the freedom to add custom fields specific for each category. To display the maps, the theme has google maps integrated with it. For transactions, Classiads come with Paypal integrated. 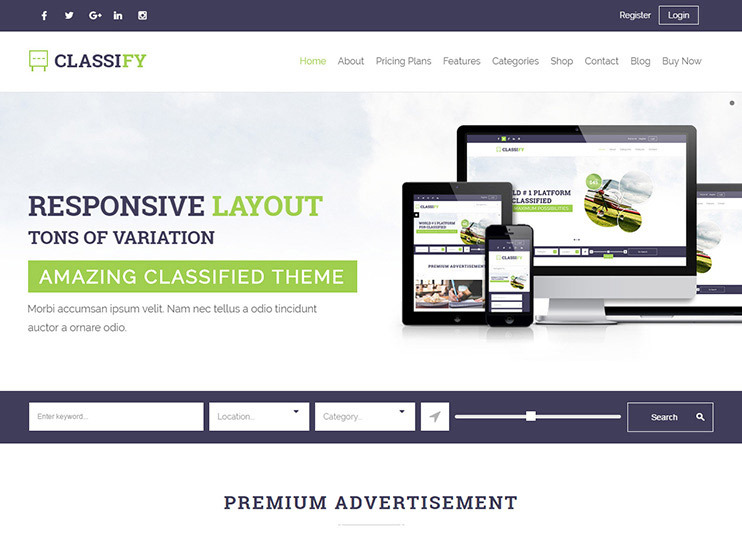 Classiads is an SEO ready theme. Not just the classified advertisement, the theme also allows to post blogs very beautifully. For letting you have advertisements, the theme supports Google AdSense. Vantage is a popular Business-Directory based WordPress theme.This theme is clean and easy to use with no coding skills required and can be setup in minutes with one click demo install.The theme has many popular features like claim listings,user dashboard, search functionality and many more. 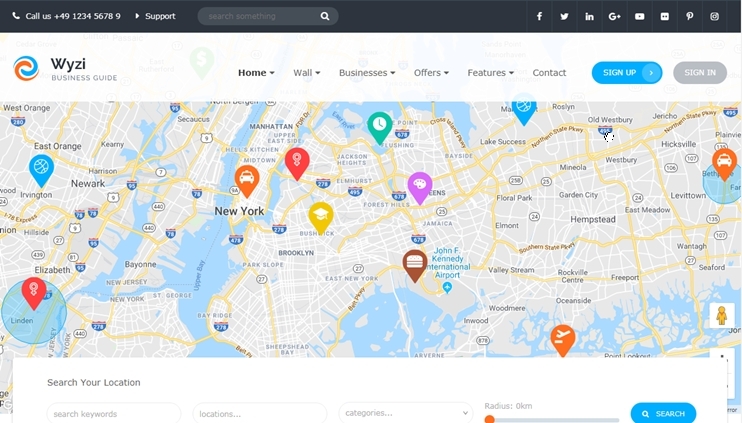 This Business Directory theme is very much responsive and SEO friendly.The theme is open source code and supports Multi Language Support and Multi Currency option.With vintage theme, you can easily generate income using the price package options and get increasing income using the recurring payment functionality. 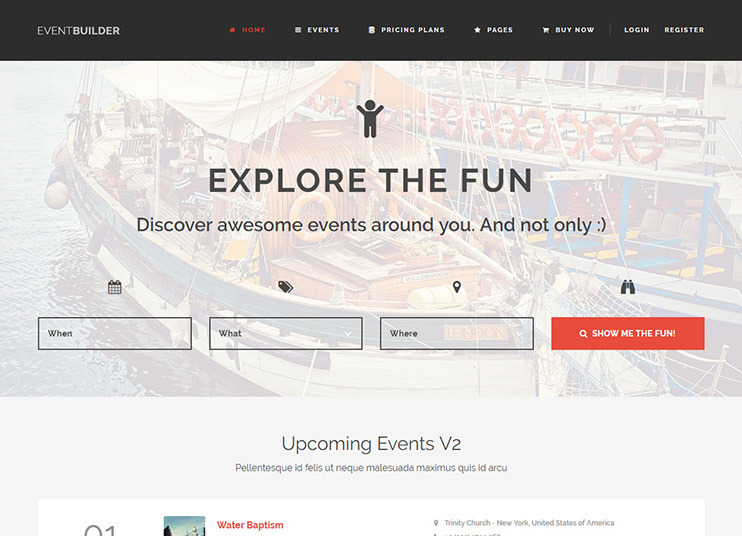 EVE is a WordPress theme that is focused on Events. The theme is created completely upon WooCommerce so it gives completely familiar backend access and familiarity. The theme has extended all the functionalities that WooCommerce provides. The theme can be used as Events listing as well as Directory listings too. The theme includes features as such FrontEnd Submission, Paid Claims, Package System, is compatible with Visual composure. 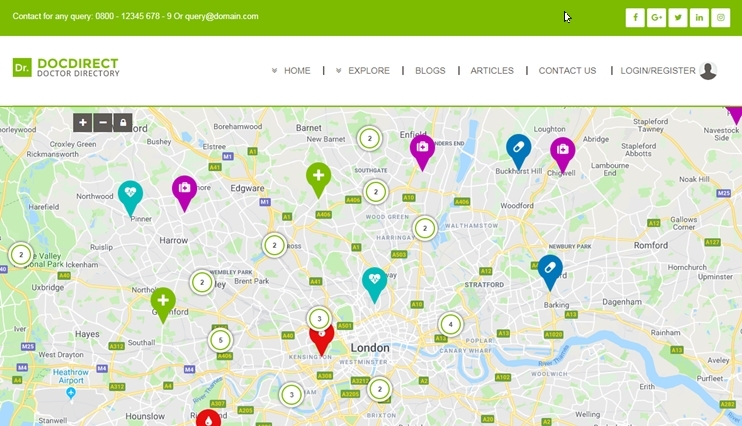 Like other WordPress Directory theme, it also has integrated Google Maps and locator. We can easily create websites for events may it be any. Listable is a listing based theme to let you create a Directory. With Listable you can easily create and manage a local or global Directory. It is full of features and lets you earn online through your online Directory website. Even though the theme has a very simple interface to manage the website, it has the most powerful features. Everything that is needed to manage and display the listings is available in the theme. With the easy theme options, the theme can be made to work just the way you want. The additional features you may need are provided in the form of plugins. This makes the theme simple. This way you won't have to deal with the features you don't need and just install the plugins of your requirement. Listable comes with style presets and lets you create your own style by changing the fonts and colors. All this can be done using the Live customizer. To offer maximum flexibility, the theme has a fully widgetized front page and listing page. So you can change the page elements easily. The FacetWP plugin is integrated for advanced filtering and search functionality in the theme. You can also select the preferable page builder, Listable is compatible with - Visual Composer, Motopress, beaver builder and site origin. Monetizing your Directory is easier with Listable, you could sell listing packages and charge users to post listings on your site. This can be done by WC paid listings. You can also sell subscription by the WooCommerce subscriptions plugin. Listable is tested for a great user experience. WYZi is an advanced Social Business and Service Online Store Directory theme.Here, Listings Owners have Dashboard to manage their Listings from	and Clients can buy products or Book Service from Business Owners.Business Owners or even the admin of the site can add listings/business/upload jobs/products as they have their own frontend profile and Clients can like or comment or make the listings as a favourite to direct interaction between clients and business owners. One of the powerful feature with WYZI Directory theme is Booking where Business Owners can manage appointments and bookings for their clients to make an online booking.Customers can also view their Booking and Appointments through their User Dashboard. 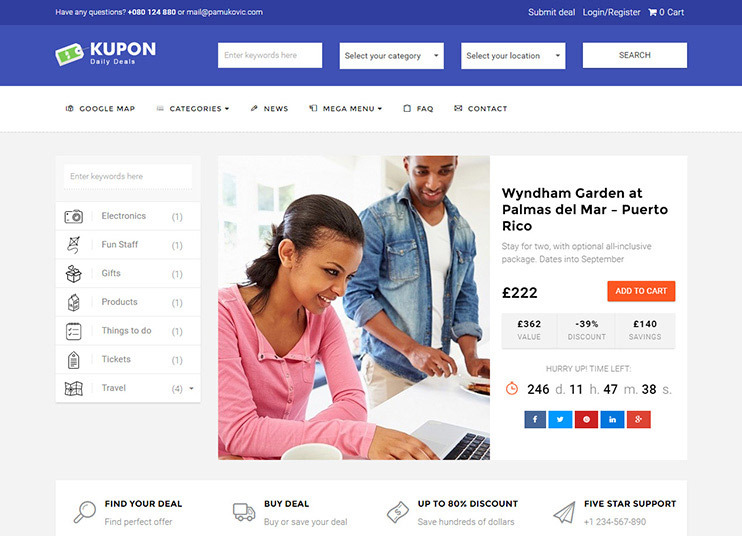 The KUPON theme is ideal for daily deals website. It can be used to create a daily deal marketplace website. For drag and drop page building the theme comes with integrated Visual Composer. With KUPON, you can create a website that allows frontend deal submission. Not just submission, the users are also allowed to edit the deals. 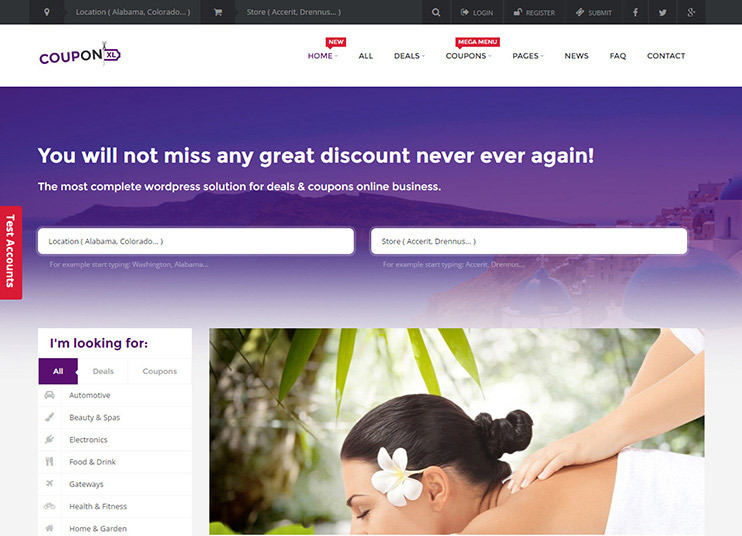 The theme has integrated WooCommerce PDF Vouchers. To keep the theme lightweight, the functional modules are moved to plugins. So, you can install the plugins easily and get the desired feature. This way, you won't have to bother with non-required features in your theme. KUPON is child theme and multi-site ready. KOUPON is also compatible with WPML for creating a multi-lingual website. DWT is a Directory & Listing WordPress theme which you can create and customize your own site with multiple pre-made websites available.This theme Listings Directory theme is clean and well optimized.The theme has some elegant features like Listing Reviews ,Bookmark Listings , Listing Ratings.The theme is very much responsive and translation ready. 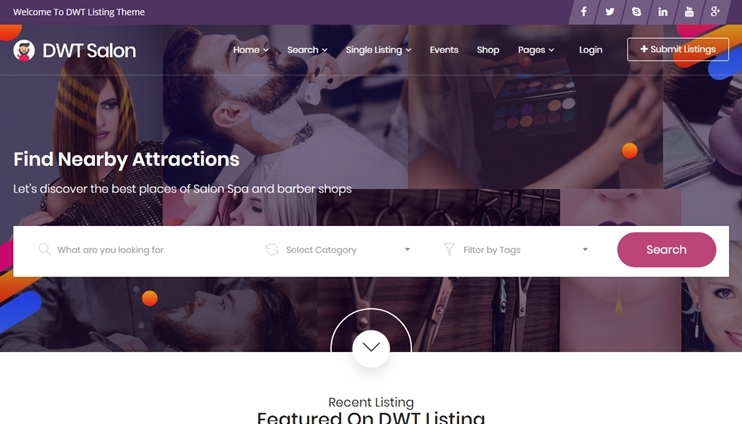 With DWT directory theme you can earn revenue through claim a listing,submission of listings and products,advertisements and also provide coupon code for discounted price. Directory portal is one of the best-selling directory WordPress themes. It has a modern and responsive design. The theme ensures that your viewers are not disappointed regardless of the device they are viewing your site on. 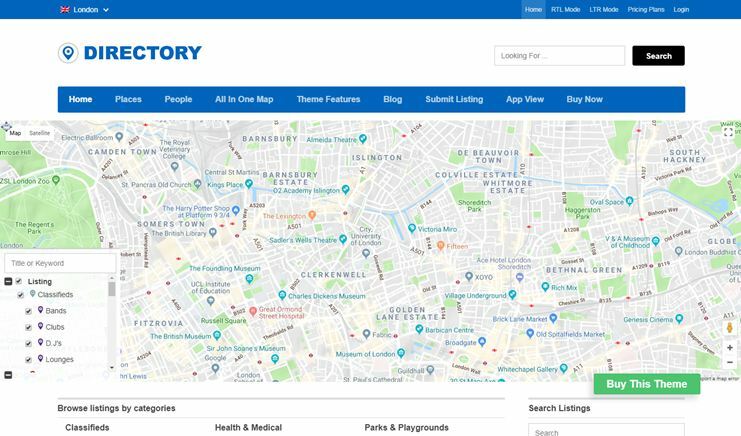 You can use the Directory Portal to create a website for any business, company or shop. You can choose what kind of header you want for your pages - Static, google map, 3D google maps, video, etc. Directory portal comes with a drag and drops page builder and more than 30 elements to create your site. To extend the functionality of the theme, you can use the available plugins. The admin panel has the options to customize every detail of the theme. With directory you can even add jobs, events, pricing tables, and portfolios. The google maps are there to display the listings with the pin on it. And there's a set of customized pins, that you can use to represent different categories. Every minor detail like backing up the data, custom CSS editor, advertising spaces on the page, featured listings, sorting options, mega menu, geo-tracking, creating and managing the price packages, etc is included in the theme. Listify is a directory theme from Astoundify. The theme is an elegant listing based theme that can be used for multiple pins. Listify comes with easy customization options and a flexible layout. It allows you to customize the page layouts with drag and drop editor. So, create and manage page layouts according to your requirements. Besides, the theme admin panel has lots of option to customize the website. With intuitive and easy options you can make it work the way you want. Besides the good look and customization features, Listify also comes with wonderful features. Making use of the geo-location technology it ensures that you are shown relevant results. Listify is optimized for performance and load speed. It is SEO optimized too. Listify offers you a lot of opportunities to earn through it. For example, you can charge a user for posting a listing or claiming a listing. You can also charge the visitors to subscribe to the site. Besides, you can post advertisements, and earn from it. You can also make the users pay for making reservations and appointment, or to view private listings. One advanced feature of the theme is that it can help you make your entire site private and grant access to the paid users only. 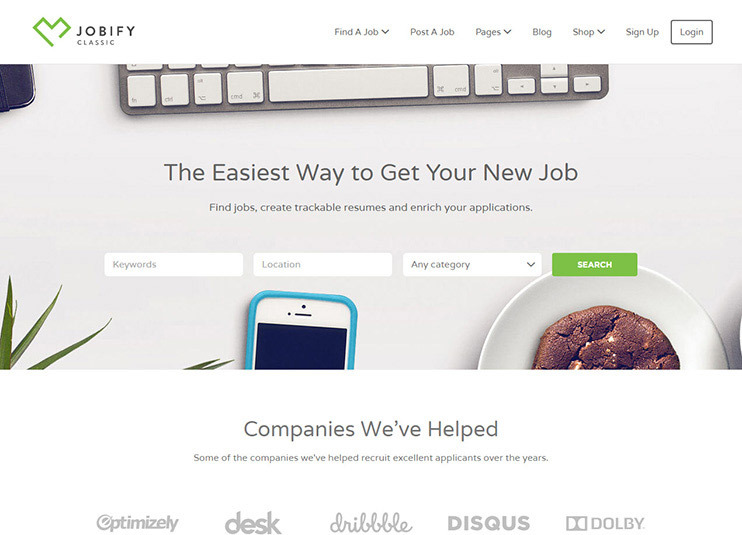 Jobify is a directory WordPress theme for creating an online job board. The theme has a professional and responsive design. The design has been specially optimized for iPad and iPhone. It is retina ready too. Even though Jobify has easy options to customize, it comes with inbuilt page templates. Jobify works two-way, for the job seekers it works as a job portal where they can search jobs and submit their resume. For the Employers, it allows them to post their vacancies. Jobify comes with ready-made page templates for your utility. It offers compatibility with the Job Manager plugin, Resume manager, Gravity Forms, Ninja Forms and WooCommerce paid listings. To customize the design of the theme you can use the intuitive admin options. You can create a jobs site in your own language using the .po and .mo files available with the theme. If you want to create a website with multiple languages, that too is possible using the WPML plugin. Business Finder is an extensible and flexible Directory listing WordPress theme. The design of the theme is responsive and retina ready. Business finder has a modern, simple yet attractive look. The Business Finder theme comes with a drag and drops page builder. There are over 30 elements that you can use to design your page. So, with the Business Finder theme, you can create a page of your own imagination. Like any other popular theme, this theme comes with unlimited customization options. This theme has options to choose the header. You can define whether you want to display video, image or map in the header of the pages. There's a long list of compatible plugins for the Business finder directory WordPress theme. You can use the business finder theme to create a website in any language using the WPML plugin. To sell online using the Directory website, you can use the WooCommerce plugin. Business Finder is SEO optimized. 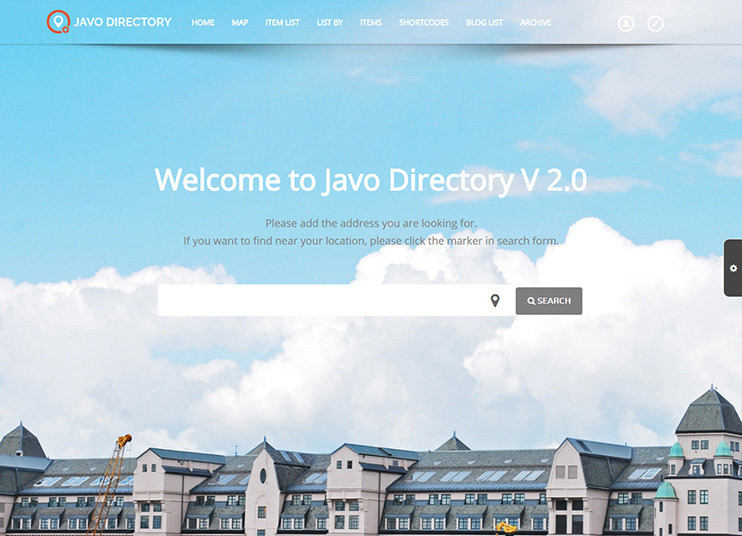 Javo themes have come up with a very elegant version of Directory - The Javo Directory theme. It already has 5 demos and promises to provide more. You can choose the demo and install it to make your site look exactly alike. Then, you can update the content with your original data and make necessary customizations. The Javo Directory makes use of the Google maps to show the listing. You can sort the listings on the maps based on location or categories. To add to the features, Javo Directory is compatible with the Visual Composer. The Visual composer will let you design pages with drag and drop options. For flexibility, the theme also offers you to create custom fields. For accepting payments, the Javo Directory has PayPal integrated. It also has pre-built forms that can be used right away. Javo Directory can be made to look and work the way you want by using the admin panel. This panel has simple options to change the look and feel of the theme. For newsletter facility, the theme comes with Mail Chimp integrated. There are many more features of the theme. It allows Ajax search, customizable ratings, and events. It comes with social share buttons and many other options like add to favorites, etc. The Box Directory theme from Chimp studio is a truly multi-purpose premium directory theme. 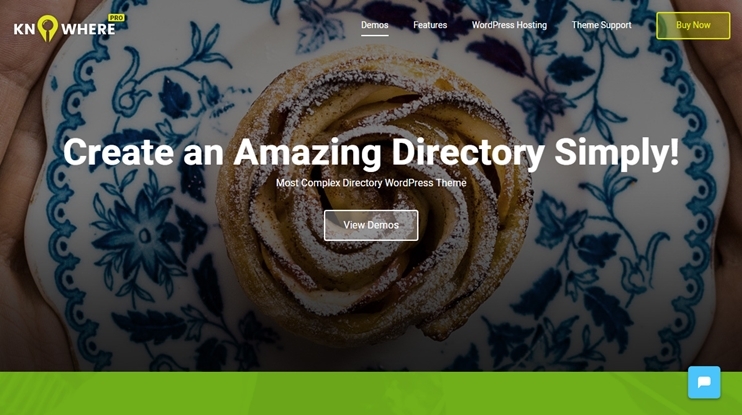 With this theme, you can create a directory portal of any kind. A directory for Jobs, listings, cars, Classifieds, etc. With the Directory theme, the visitors can search their required information. The search results provided are logical and location-based. The listings can be posted as free, paid or featured and under any desired category. A user can submit the listing from the front end. Before that, he will need to register and login to his account. You can also set an expiry date for the listing. For accepting payments, PayPal comes integrated with the theme. This WP Directory script has a pre-loaded drag and drops page builder to let you create pages with your creativity. To change the appearance of the theme, you can use the Admin panel. This admin panel gives you easy options to change the colors and font of the theme. Directory comes with unlimited colors, sidebars, and fonts to change the theme style. If you want to offer your website with the option to select the language. Use the WPML plugin to translate the theme into multiple languages. A directory is SEO optimized. 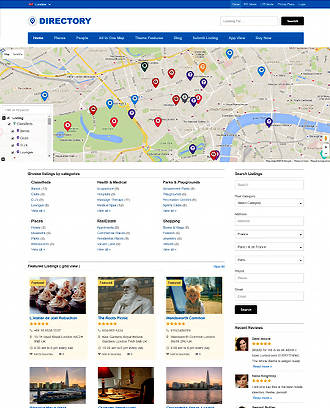 The Navigator is a Directory WordPress theme that is ideal for creating a location or travel guide. It is a simple theme that accepts listings on the basis of its location. The Navigator uses the Google maps to show the map on the homepage. The home of the Navigator shows just the map with markers on it. You can click on the map marker and it will open the detail for that location. On the homepage, you have the welcome message option using which you can show the visitors a message or tips or direction for the website's use. You can also change the default dark skin as light. The Navigator is a directory theme with features to support its purpose. There are options in the back-end through which you can add and manage the locations to be shown on the map. To display the location on the map, map markers are shown. You can use custom map markers instead. It is possible to convert the theme into the desired language using the .pot files. WPJobus is a standalone jobs directory that works without any further plugin integrations. The theme works for 3 purposes - Job board, Resume, and company profile. The theme has a responsive and mobile ready design. Your visitor can use your site to get results filtered on the basis of 3 main criteria. The job seeks can go for companies, the employers can view the resumes. The job page of the WPJobus is elegantly designed and comprehensive. All the details for the job are displayed in an engaging way. The page elements of the theme have beautiful animations and transition effects. WPJobus can also be used as a personal resume template. 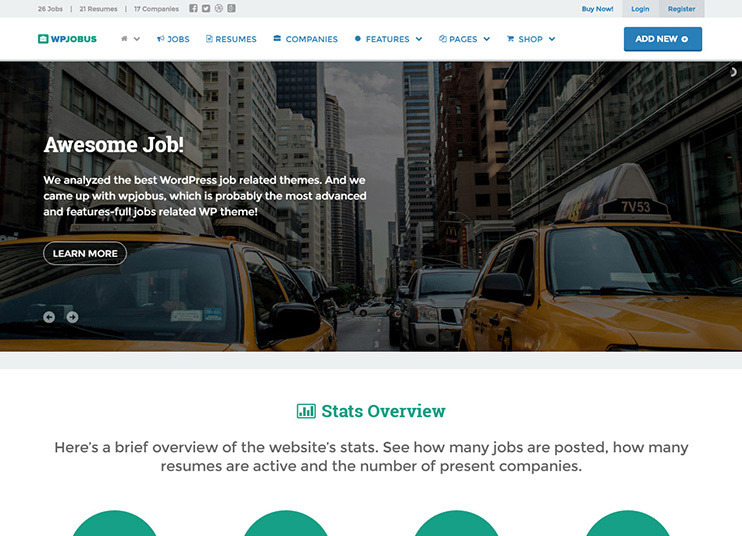 The WPJobus, job board theme can also be used to create a company website! The detail pages of the theme are so well planned that they can be used as a single page website. WPJobus also provides the facility of e-mail alerts to the users when job, company or resume of specific category or location is posted. For the facility of the visitors, the theme allows facet-based search. The visitors can find what they want without going through all the irrelevant pages. For easy customizations, there are shortcodes and comprehensive theme options. So you can change the colors and fonts easily. CouponXL theme is for you if you want to create a website that sells deals, discount and coupons. The theme is responsive and light weight. With the theme features, you can allow your members to post ads on your website. You can earn money by charging them to do so. All the advertisement, coupons and submissions can be managed conveniently from the back-end. CouponXL comes with a coupon generator to generate the coupon codes automatically. It has an advanced user dashboard where the registered users can manage their accounts. The pricing options are vast and manageable. you can charge the different fees for the submission. The fees can be fixed, percentage based or both. There are more options when it comes to deals. You can set the "time left" or "items left" kind of deals. If you wish to insert large coupon or deals data at once, use the .xml importer. The CTR tracking system will let you track statistics and visits. CouponXL is translation ready. Create a website in any possible language with it. Moreover, it has faster performance speed. The theme also allows you to display advertisement on your site. Nine to five is a premium Jobs board theme. The theme is ideal for creating a simple Jobs site, that lets you earn from it. It is responsive and mobile ready. You can choose from the dark and light version of the theme. You can select the currency and accept payment using PayPal. With this theme, the employer can post the jobs. You can let them post the jobs for free or charge them using the paid job listing. Also, the job seekers can search the job. Job search is made easy using the Ajax filtering. 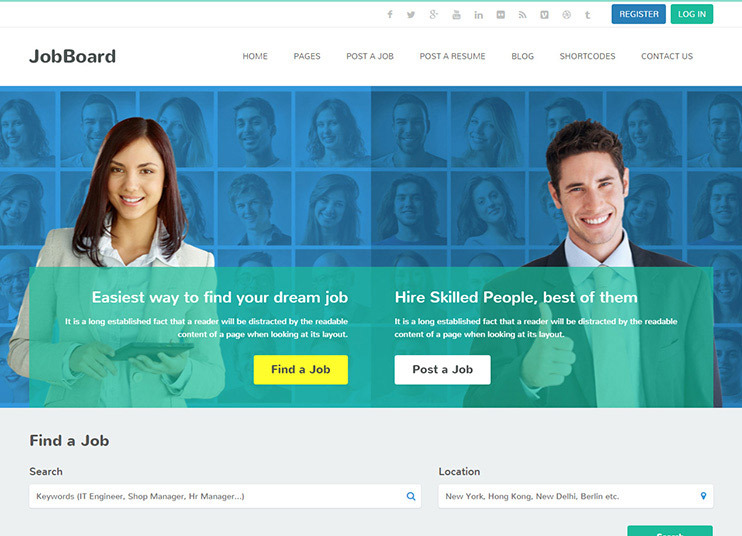 This theme has an inbuilt sharing option to let users share the jobs on their social networks. You can use your Nine to five themes, to create a multi-language theme. The theme also has a separate blog section with comments. Nine to five can be used to create a website in any language. The light code ensures a speedier performance of your site. 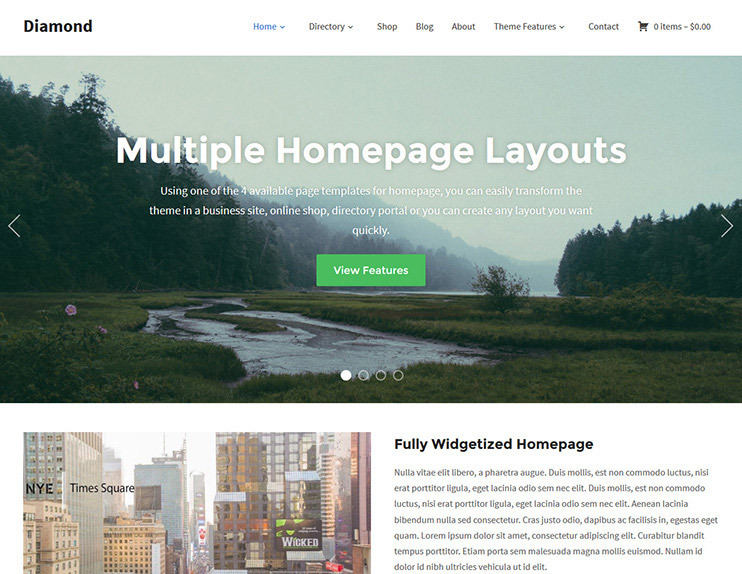 FlatAds is a is responsive and retina ready classified WordPress theme. You can use the theme to create an online Classified Directory. FlatAds supports Google Maps with geo-locations support. For e-commerce and trading facilities on your website, you can integrate WooCommerce. You can also start forums on your site using the bbPress plugin. The admin panel of the theme has the options to change the look of the theme. To make your classified website look more intuitive, you can add the vector icons supported by the theme. Layer Slider can be used to display the slider and beautify the site. You can add custom fields specific to a category or a sub-category. This makes each category more distinguished. FlatAds is Multi-language ready. 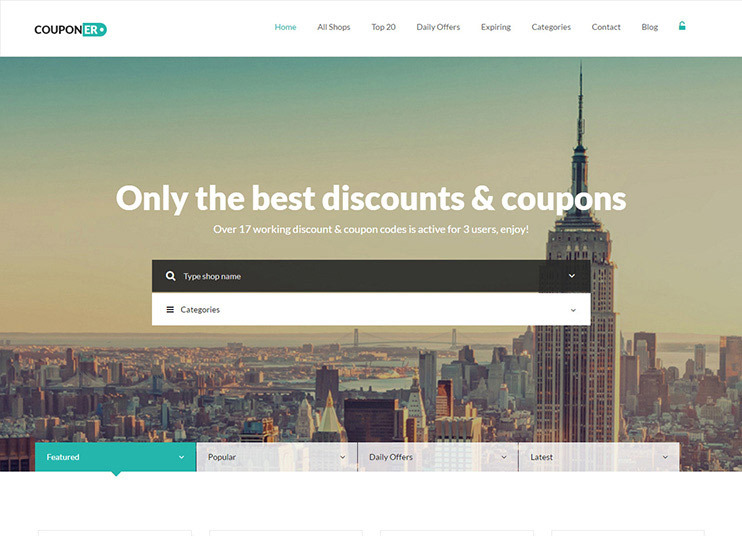 Couponer is a powerful coupon and discounts theme for WordPress. The Couponer theme is highly customizable and has unlimited colors options. Couponer comes with many inbuilt page templates. It also has custom widgets of its own. Couponer has a clean code. The admin panel of the theme allows you to customize the site as you want. Set colors for different sections, fonts and even background as a whole. With the Couponer theme, you can offer membership system on your website. The members can submit the Coupons and discounts. The theme has MailChimp integrated for newsletter facility. With the advanced search option, the theme allows the visitors to easily find the deals of their interest. Couponer is an SEO optimized theme. To create a multi-lingual website, you can use the WPML plugin. 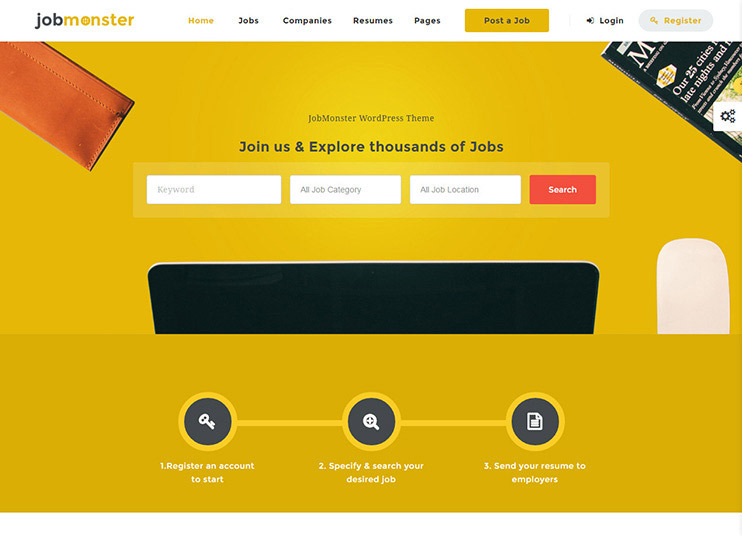 Job monster is a stand alone theme that offers job management facilities without requiring any additional plugin. The employer and candidate can create their account and manage everything from the front end. The jobs can be submitted by registered employers from the front end. The admin can review a job before publishing it. Similarly, a candidate can also submit his/her resume from the front end. With the integration of WooCommerce, pricing plans can be created for jobs posting. The registered Employer can log in and view the dashboard. The dashboard has the options to manage the company profile, posted jobs and view and respond to the applications received. Similarly, the candidate can log in and edit his profile, manage resumes, view applied jobs, bookmarked jobs and manage the job alerts. There are three options for job application, by uploading CV/resume on Jobmonster, or by Linkedin. To this, the employer can accept or reject the application by the message. The directory of all companies will be shown on the front end. The design of the theme is totally responsive and elegant. Job monster is compatible with the Visual Composer for drag and drops page building. It is coded to cover every need of an employer as well as a candidate. The theme offers two homepage versions - A version with job search option and another with the search on map option. 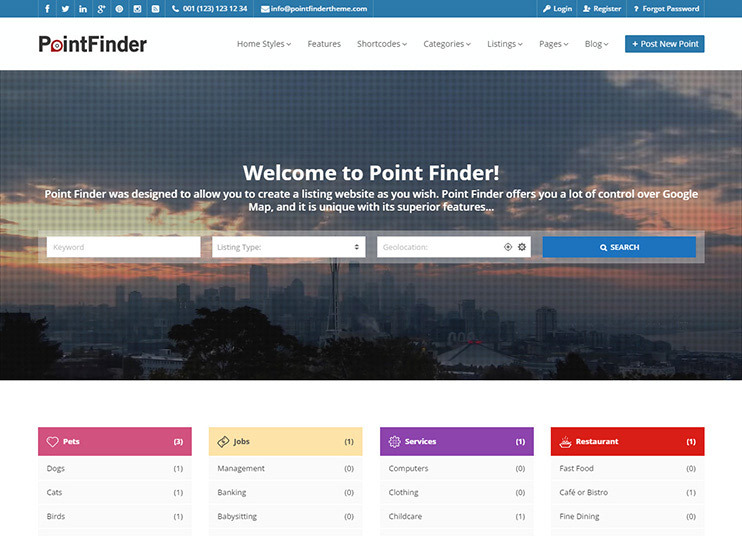 Point finder is a listing based theme that offers total control over the maps, listings and money-making options. The theme design is 100% responsive. Point finder also has a system for claiming the listings. With Google map integration, Point finder allows you to create location-based listings. It also allows front-end submissions. With the Revolution Slider, you can create beautiful sliders for your website. The comprehensive theme options enable you to change every minor detail of your website. For protection against spam, the theme has google reCaptcha integrated. For accepting payments, PayPal is integrated, you can also use Stripe, PayU Money, etc for this. The payment tracking system allows to track pending payments and provide a detailed report. The theme is compatible with the Visual Composer plugin. It will allow you to change and create page layouts with drag and drop options. Point finder is child theme ready. With the available localization files, you can create a website in your desired language. To create a website in multiple languages, Point finder supports WPML. Point Finder can also be used to create a website in RTL mode. The theme has all the required Directory features. 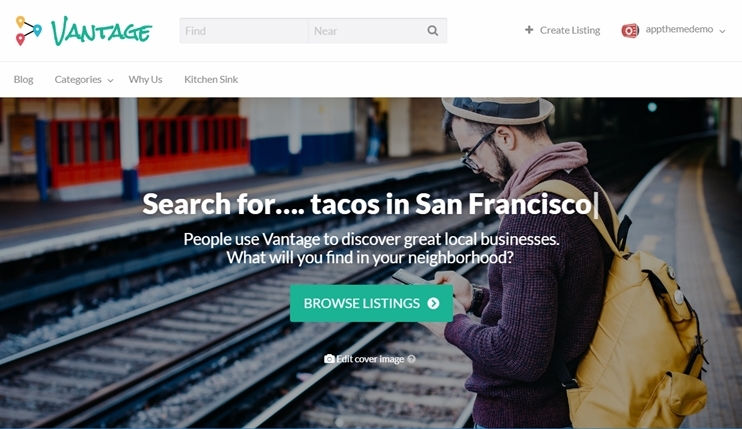 You can submit the location-based listings from the back-end as well as the front end of the theme. It also allows you to create payment packages to charge the users to submit the listings from the front end. Atlas Directory allows the user submission by registering and logging in. After registration, you can manage your profile, add the listing, subscribe to a payment package, and access your dashboard. Atlas is extremely flexible and you can use it for any purpose. With this theme, you can set up an online Directory of any subject, to show restaurants, hospitals, colleges, etc. 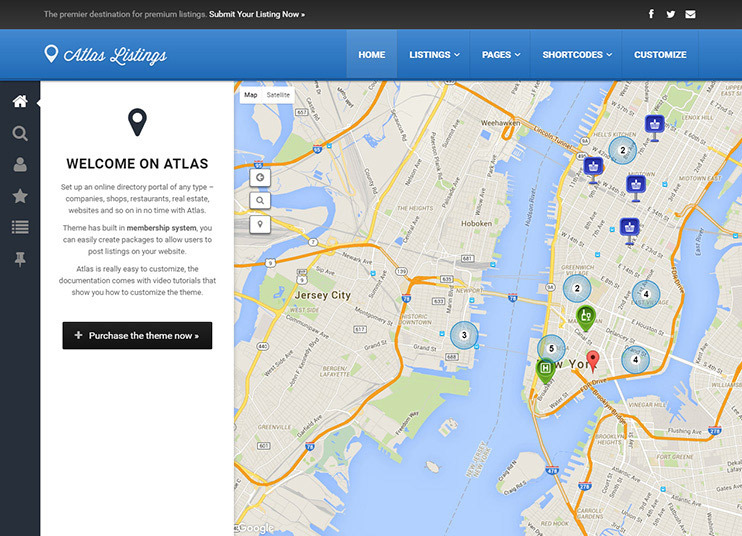 The Atlas theme also has a claim listing facility that lets the owner claim the listing on the site. One of the advanced features of the theme is that you get email alerts for everything that happens on the site. With Atlas you can add a custom field for the front end submission form. Also, it is possible to rearrange the custom fields with drag and drop. It also allows to bulk import the listing data with the Really simple CSV importer. The visitors will be able to easily search through ensuring a great user experience. They will also be able to leave their ratings and comments for the listing. The facility to mark as a favorite is also available. 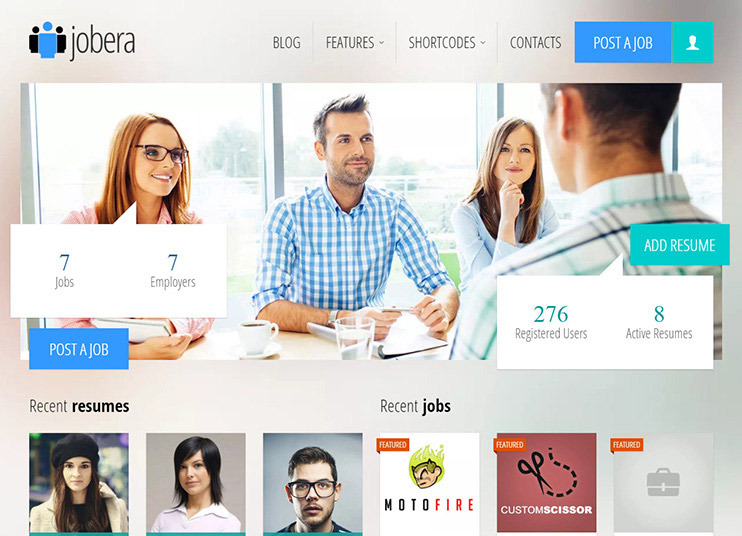 Jobera is a job board theme with responsive and retina ready design. You can use this theme to create a professional job board. The admin panel of the theme is full of intuitive and simple customization options. With it, you can change the colors of the theme. You can also select from the Google fonts to change the typography of the theme. The advanced theme options will allow you to change the theme settings. Jobera comes with a front-end drag and drops page builder. This makes it very easy to create and change the page layouts. The theme also lets you design the website in a responsive way. You can design considering how it will look on desktop or mobile. The posts on the theme can play the videos embedded from YouTube, Vimeo or DailyMotion. Moreover, Jobera also comes with utility-based widgets and shortcodes. You can create a job board that converts itself into multiple languages. This can be done using the WPML plugin. 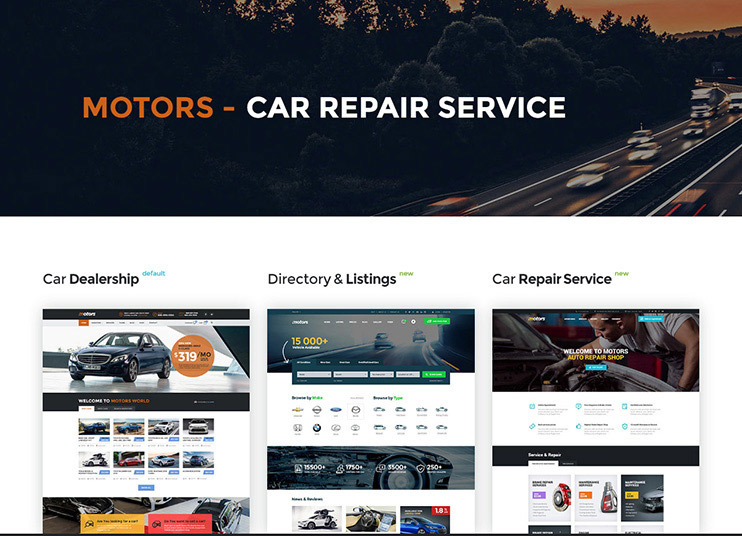 Motors is a theme with modern design for creating any kind of Car dealership website. It has a responsive and retina ready design. The theme has 5 pre-defined skins you can choose from. You can also choose from the boxed or full-width layout. With the drag and drop page builder, the page management is a lot easier. Motor comes with an inbuilt finance calculator. The theme also has a comparison feature. With this feature, you can compare the vehicles based on their described specifications. To create a more futuristic website, you can use the available shortcodes. Motor supports WooCommerce to sell online. The search through the website is made easier with the categories and filtering options. Users can create an account on the website and manage their profiles too. They can then post their ads from the front end. With easy options, you can create and manage your inventory on the site. The theme is your ultimate solution for selling, buying or leasing motor vehicles. 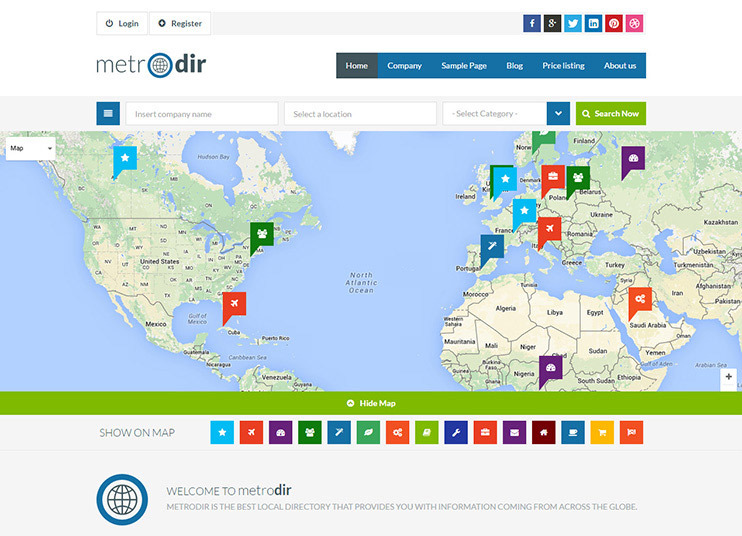 MetroDir is a theme for letting you create listing based Directory website. It is content based theme and ideal for creating any kind of online listing Directory. The theme has an inbuilt Visual composer for letting you build the pages with drag and drop. To customize the theme you can set the color you want. You can choose from the full width or the boxed version of the theme. Also, choose from the icons and custom map markers to make the website look more intuitive. MetroDir also allows you to choose from 4 header styles. With the theme, you can create and display a company portfolio too. The powerful theme options make it possible to make the theme exactly how you plan. The theme is multi-language ready. Metrodir also supports child theme. 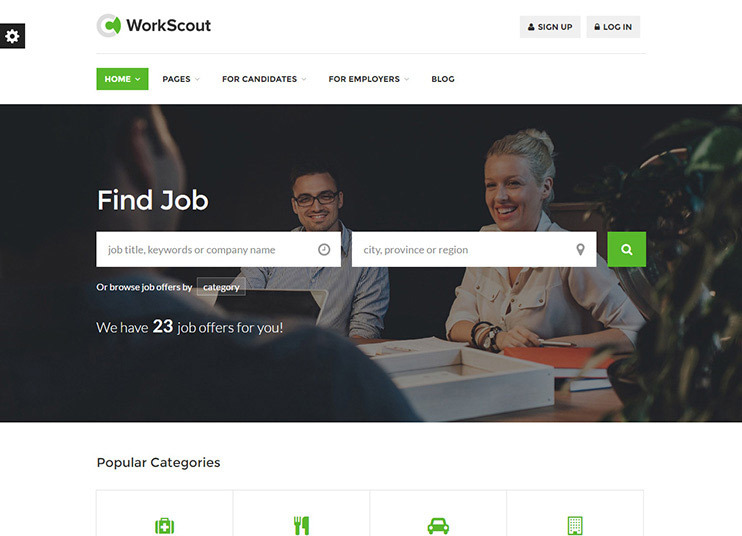 WorkScout is a full-fledged Job board theme. You can use this theme to create a website where users can submit or find the resume and jobs. Work Scout provides a framework and you can add plugins to it to get the desired features. For example : WP Job Manager plugin comes free with the theme. This plugin is used to include the job management features into the theme. The optional plugins are Resume manager, Job alerts, Bookmarks, WP Paid Listings. The Resume manager is needed to allow the users to submit their resume. Job alerts plugin for enabling the user to get alerts when a new job is posted. Use WooCommerce paid listings to charge the users to post jobs or uploading resume. For the best user experience, WorkScout has the feature of advanced filter. The advanced filter will filter the jobs based on the required criteria. To let you create pages with drag and drop, WorkScout is compatible with Visual Composer. The slider in the theme can be set using the Revolution slider plugin. So, this theme is a beautiful way to create and manage an online Job board. EventBuilder lets you create categories and locations to let the user select for entering their events. The theme also allows you to create price packages. The events will be shown on the maps. The theme will allow you to define review criteria unique to categories. The theme has a pre-built events submission form. The form is very comprehensive and has all the required fields. Event Builder comes with Google maps integrated. To sell events ticket the theme allows compatibility for Tickera and Ticket Tailor. EventBuilder also comes with Ajax login, registration and reset password fields. Besides, there are any pre-built page templates in the theme. The theme is responsive and retina ready. It also has spaces where you can display advertisements. EventBuilder is compatible with Ninja Forms, Gravity forms, and Contact Form 7. Auto stars is a directory for cars and automobiles listings. 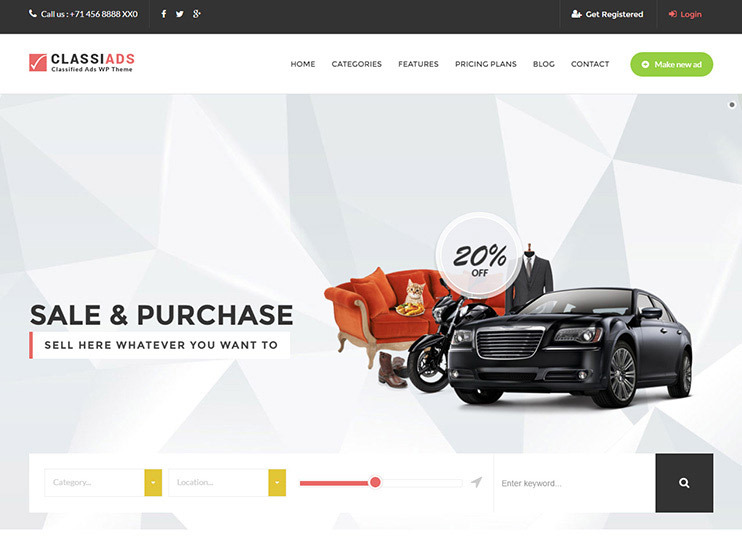 With this theme, you can create a website for auto-dealership business. Most of the theme management can be done using drag and drop options. 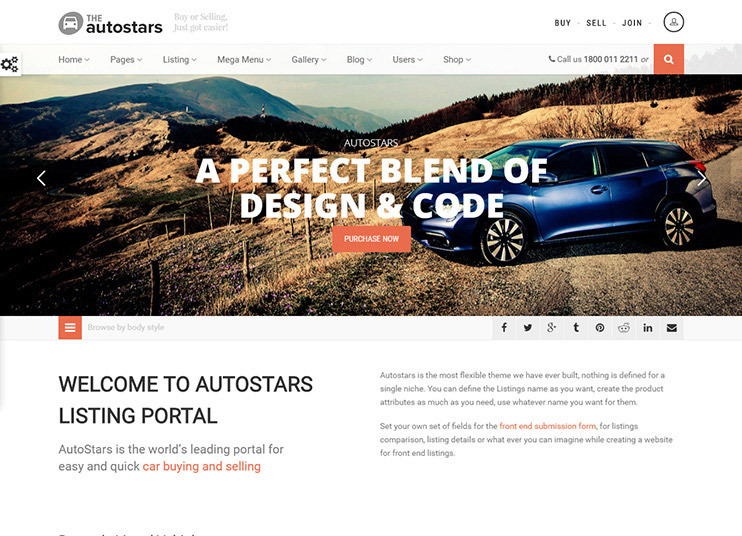 Autostarts have a responsive and retina ready design. The theme options are intuitive and easy to use. All the management of the theme can be done from the back-end options. It enables you to change the colors, background, and fonts. After registration, the theme also has a functional dashboard for the users. For frontend listing submission, the theme has a pre-built listing submission form. The users can use this form to submit listings. The form is comprehensive and covers the required details. You can add the fields in the form and manage the existing fields too. For reliability, the theme also has a Dealer profile page. This will show the dealer information, the listings submitted by him recently, etc. For the convenience of visitors, the Auto stars will also let the users compare the listings. 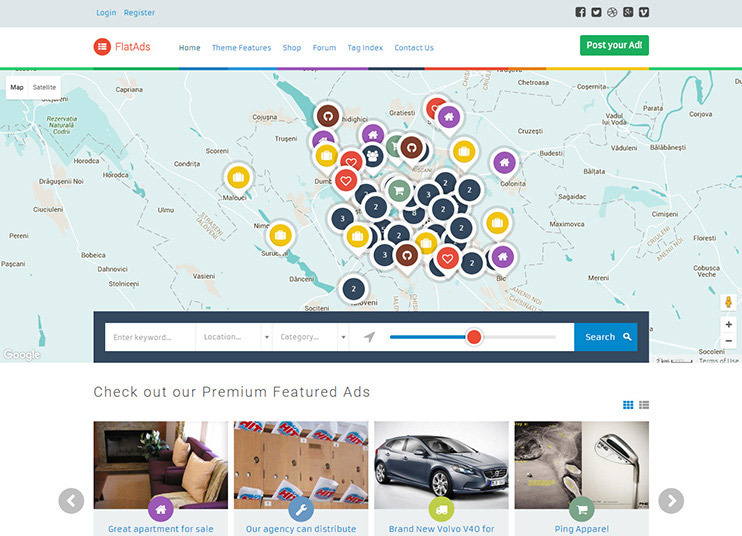 Classify is a classifieds Directory theme. The theme allows you to create a classifieds website to create an online marketplace. You can choose from the homepage versions and the demo color combinations for the Classify theme. Using the theme you can create a website that shows the listings of classifieds based on categories as well as locations. For accurate results, Classify uses the geo-location technology. The visitors can submit video ads too using the website. Classify comes with the PayPal payment gateway integrated. The featured ads option is also available with the theme. Besides, there are any features in the theme that makes it one of the best classifieds theme. It comes with a working contact form and a shortcodes system. It is SEO friendly. Moreover, Classify can be used to create a classifieds website in any language. The theme can also be used to create a multi-lingual website using the WPML plugin. Job Board theme is for letting you create a comprehensive Jobs Directory. Job Board comes with more than 12page templates. The front end resume and Job manager will allow the front end users to manage their resume and jobs. The theme allows the visitors to efficiently search for the jobs. With integrated Revolution slider, you can manage the sliders of your website. The jobs can be submitted from the front end too. 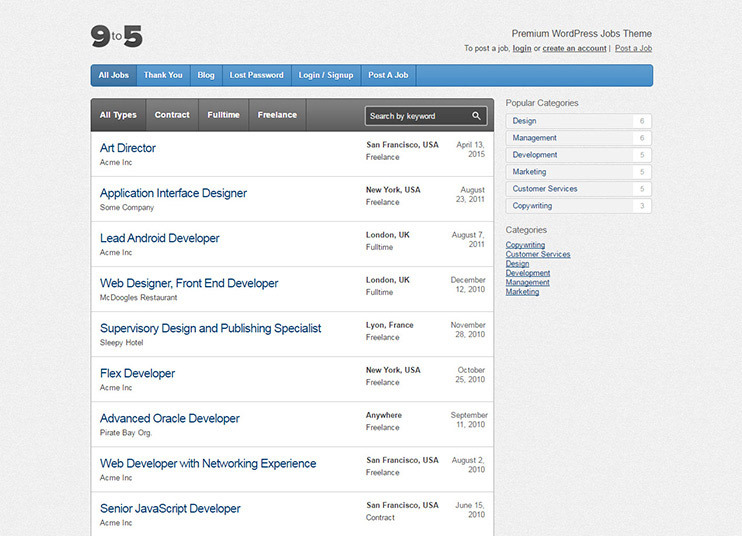 The jobs detail page contains an Apply for Job button. Job board supports child theme too. For CSS changes, there's a custom CSS editor in the theme. The theme has strong monetizing features too. You can charge your users for submitting jobs and accessing resumes. 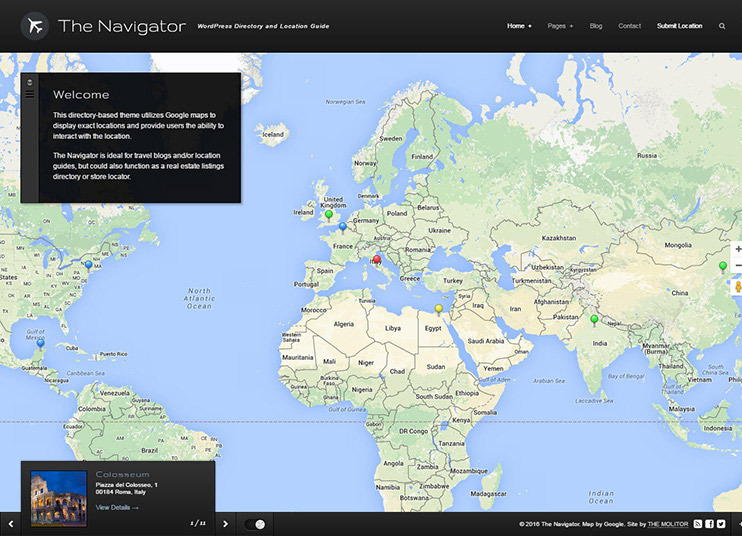 The theme comes with a built-in contact form, PayPal and Google map integrated. The very powerful theme options can be used to customize the theme. Besides, there is the number of shortcodes and widgets available for the theme. Babysitter can be used to create any baby-oriented directory website. The theme is best suited for a babysitter, nanny, for creating a job board for such jobs, as a blog for baby care, etc. 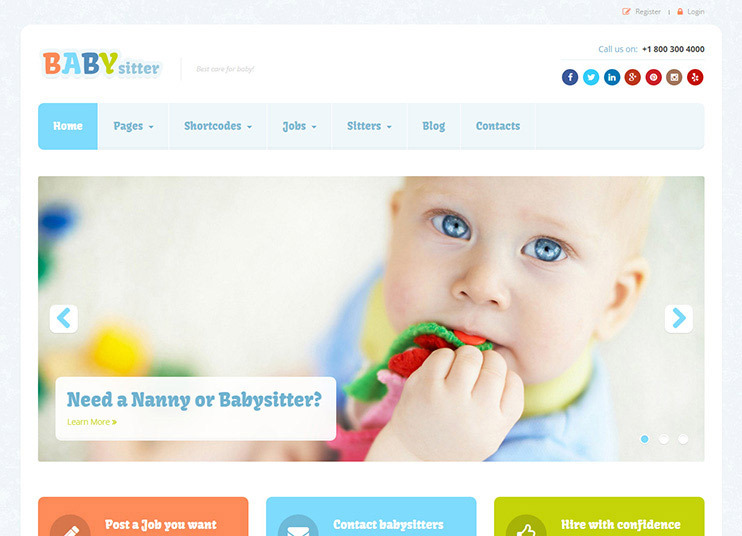 The theme can primarily be used as a Job board for babysitters. Babysitter can take the help of WP Job Manager and the Resume Manager plugin for this. The parents can post their jobs offer using the front end submission form and check the applications for their job offers. While the babysitters can submit their resumes and apply for the jobs. The theme also lets you post the blogs on various topics. The theme comes with more than 40 shortcodes and a shortcode generator. With the powerful admin panel options, you can change the site colors within minutes. You can also manage the typography of the theme. Babysitter is a translation ready theme. Using the theme, you can create a baby-oriented website in any language. Directory Engine from engine themes is a customizable Directory theme. There are a number of customization options available with the Directory Engine. The theme lets you create multiple payment options for your website. To accept the payment, the theme supports multiple payment gateways. 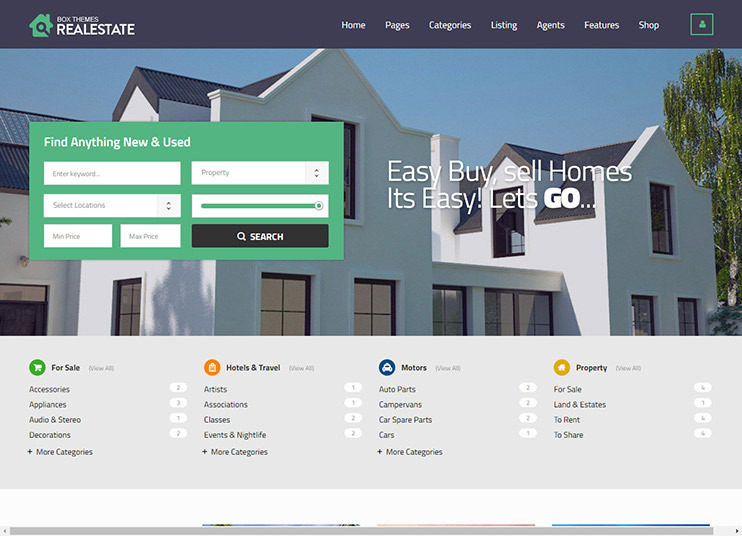 with the theme you can create listings and allow front end listing submission too. The theme also provides Front-end customization options. The content blocks and widgets in the theme can be changed by drag and drop options. 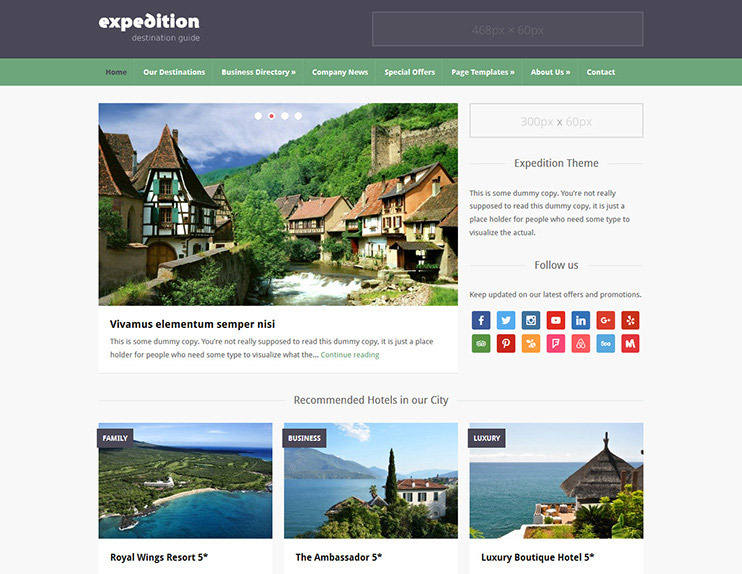 Expedition from wpzoom is a Directory WordPress theme suitable for the creating a travel Directory. 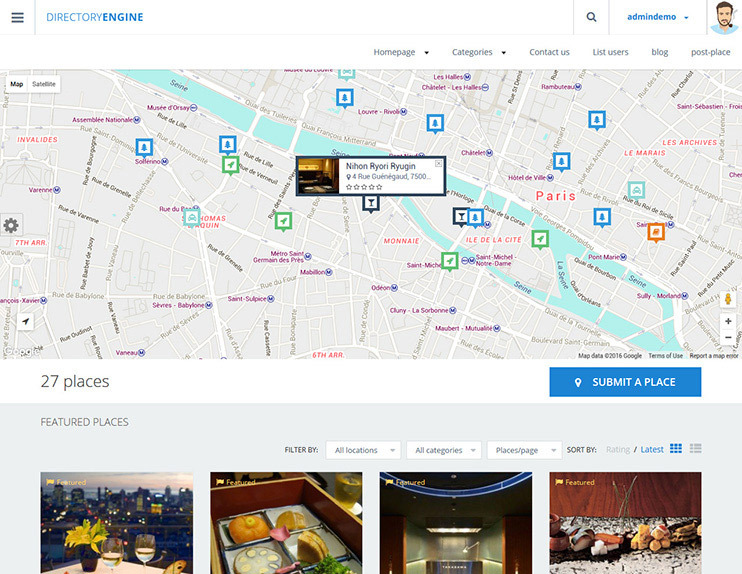 By using Expedition, you can create a website for travel agencies, city guides and review websites. The theme comes with google maps integrated. Expedition has a responsive design. The theme will create a website that works well on any device. It can be used to display the places. The homepage slider can be configured to show the posts and offers to the visitors. The theme comes with pre-built page templates that can be used to show the content. It is SEO friendly too. With the vast options and admin panel, the theme is very easy to customize. Using the Expedition theme can make the theme work the way you want without much hassle. 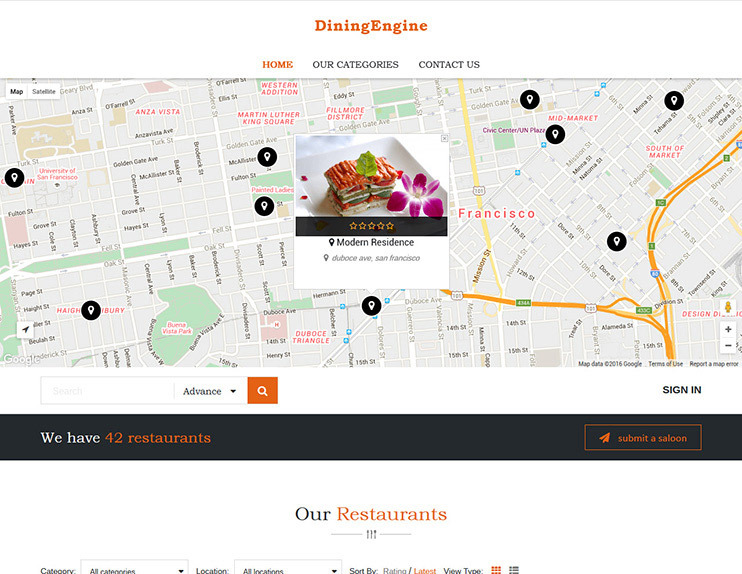 If you are looking for a professional and customized Directory theme for listing restaurants and food points, Dinning Engine is for you. The theme can be used to create a Restaurant directory. Dinning Engine is beautiful, feature rich and very flexible. Basically, Dinning Engine is a Directory, so it does everything that a Directory should. It supports front-end restaurant submission by the registered users. The restaurant owners can provide the required details and flaunt the best features in their listings. With the Dinning Engine theme, you can also add events to a restaurant. The site visitors can view the restaurants, see the details, make reservations, review the listing, and contact the owner. To customize the site, there are many front-end controls. The pages on the theme are nothing but content blocks arranged. These content blocks can be arranged and managed by drag and drop. Dinning Engine comes with an inbuilt translation panel to translate the theme. So your food point directory can be in any desired language. Directory Engine is SEO optimized too. Diamond is a multi-purpose listing based theme. 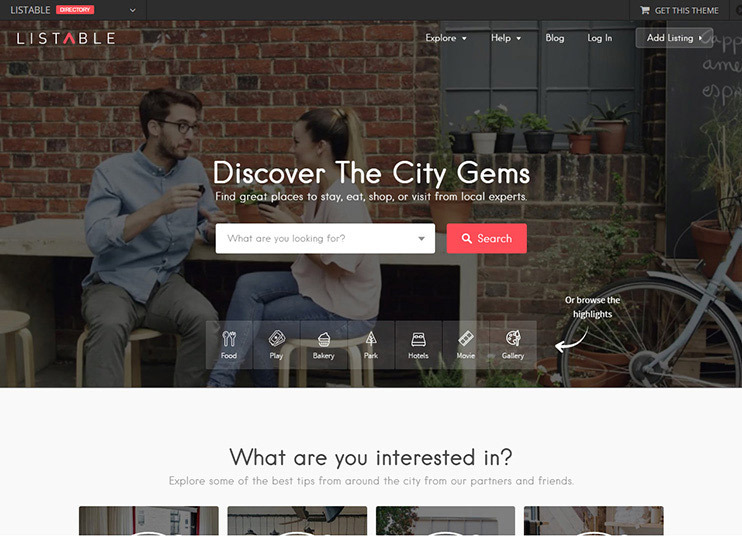 Diamond comes with four pre-designed homepage templates. With the advanced theme panel you can make the theme. The theme is compatible with WooCommerce and allows to set up an online shop too. You can set for your website, a custom background. With the translation files, you can easily translate the theme into the desired language. The code of the theme is clean and manageable. In case you need to change the code, it will be convenient. The SEO friendly code ensures that the search engine loves your site. With the theme options, you can make all the desired changes to your site. The theme does not use any custom post type for the listings. so, if you wish to change the theme, listing data will remain as static pages. 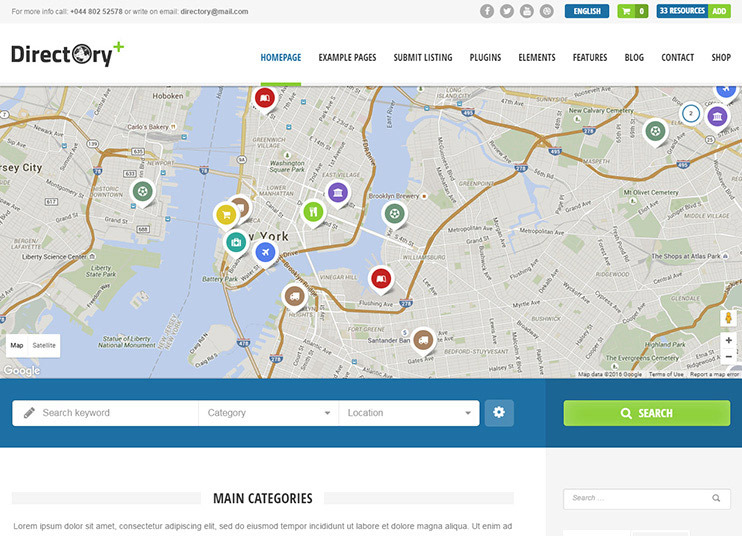 GeoCraft from ink themes is a city Directory theme from ink themes. 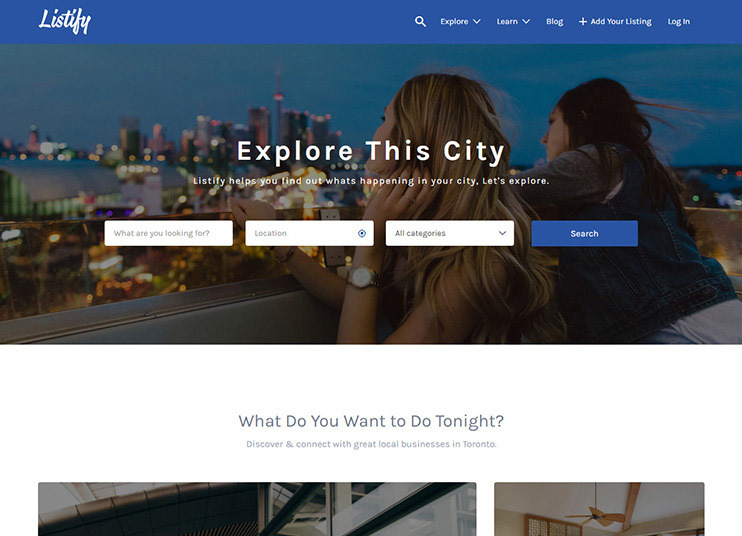 With this theme, you can create your city business Directory created within minutes. 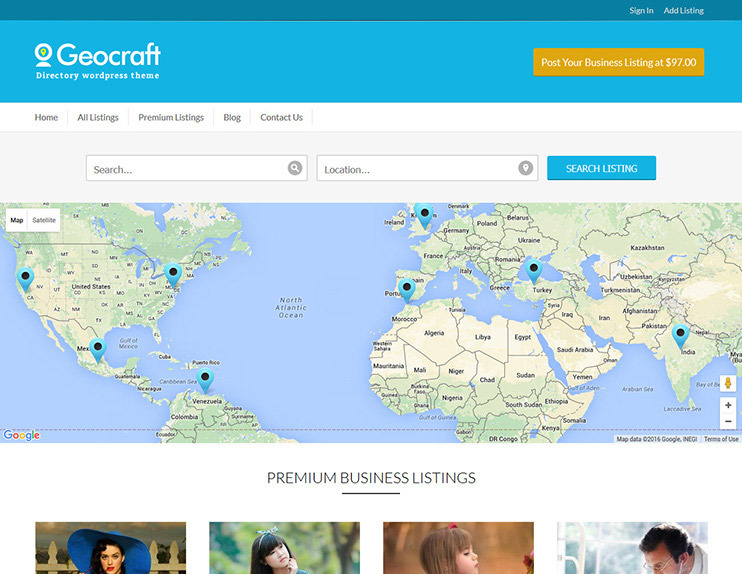 For the businesses, GeoCraft presents an opportunity to promote their business on the internet. For the visitors, it is a platform to search and view the details of the listings in their city. With the Directory, you can make your users pay for their submissions. In your GeoCraft directory, there can be a number of payment systems. You can create and manage the price package. Besides, there are other options too, using which you can make money through GeoCraft. you can also earn by displaying advertisements on your website. The GeoCraft theme displays the listings on the maps on the website. It has a lot of customization options for you. You can choose from the pre-built skins for your website. So, creating a business directory using this theme is quite easy. MyListings is a Directory WordPress theme that uses Elementor page builder for the ease of creating a page. 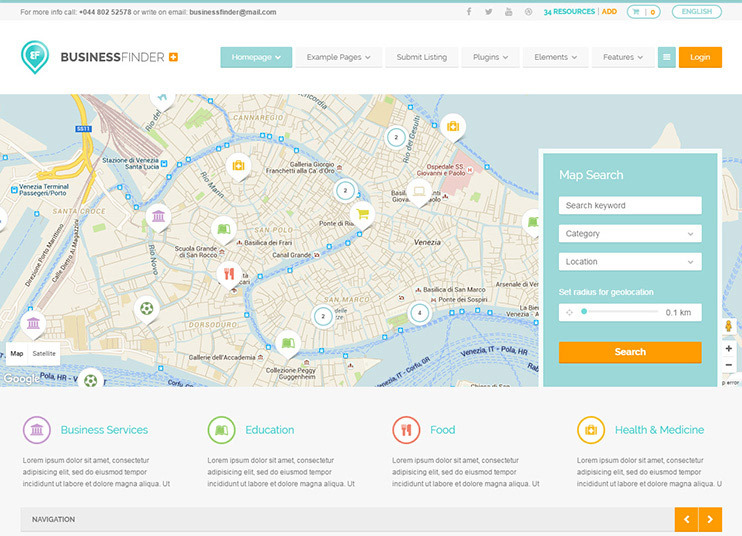 The theme is giving option of using MapBox instead of Google Maps as other Directory WordPress themes. The theme has included features such as Promotions to promote the listing, Live URL reload by remembering the filters selected by the user and not reset it. This theme gives option of customising a single page as well as explore page. In the new update the theme has redesigned the Shop page. BuddyPress integration is also available. The theme have TimeKit and Contact Form 7 as the page creators. DocDirect Directory is a responsive WordPress theme for Doctors and Healthcare. The theme is useful to create Healthcare sites and a site with the listings of doctors. The theme can be used as a engineers directory, lawyer directory, handyman directory, business services directory, veterinary directory, service provider directory, business and service finder directory, business listing or as a directory for other professionals also. The theme have 4+ search views, it also have Profile Hits Management. The theme comes with multiple Payment gateways integrated. The theme also have other features as such Drag and Drop page builder, Google Map Clustering, unlimited Font Awesome, Invoices management, Reviews management. The theme is now compatible with Bookings and Appointments also. 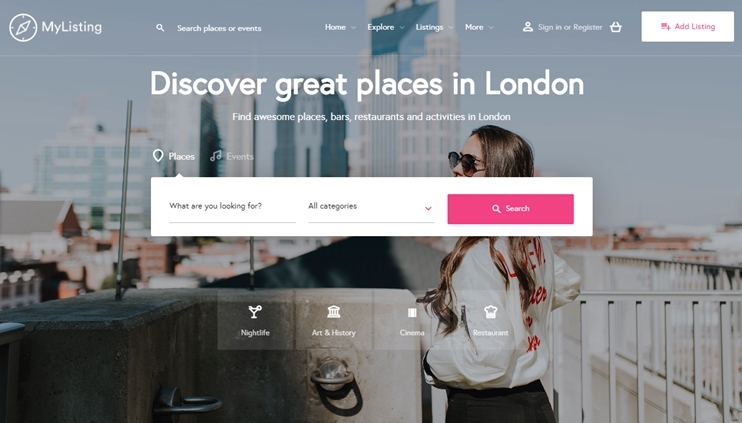 Knowhere is a complex Classified Directory wordpress theme which you can create for restaurants, cafes, bars, hotels, sightseeings, malls, museums and galleries, etc.The theme is well compatible with popular plugins like WooCommerce,Social Login Plugin,Listings Bookmarks and many more. You can also monetize your site using Claim Listings Plugin and with frontend and backend submission with WooCommerce Paid Listings Subscription plugin. Bello is a WordPress theme built for directory & listings business. This theme is easy to use and easy to customize. 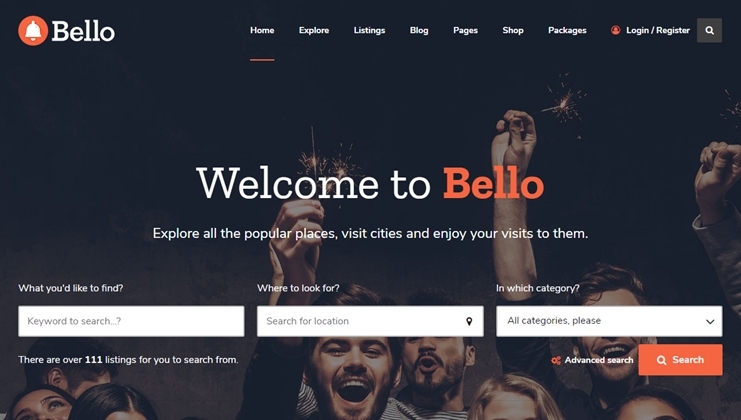 The theme is fully responsive and retina ready.Bello theme has multiple premium features like Features Listings,Local & Global Search,Multiple Layouts and many more. This theme is fully responsive,RTL ready and compatible with WPML plugin to translate the site in multiple languages.The theme has flexible widget options which you can customize your search according to your created custom fields and requirements.With WooCommerce plugin compatible you can set the subscription option to charge users for submission of listings. Lisner is a modern design directory listing wordpress theme.The theme has many beautiful features like SEO Permalinks settings,Listing Events with user frontend submissions,WooCommerce Booking feature,providing discounts and coupons with affiliate links & codes and many more. The theme is clean and fully responsive with advanced search facility according to keywords,locations or listings.You can also use advanced features with plugins like WooCommerce,Visual Composer,RTL ready or WPML and WP Job Manager plugin. These are the best Directory WordPress theme with their features. You don't need to visit different sites and search for Directory themes. Read the specifications and select the one that suits your requirements. With these easy to use and manage themes, you can start with your online Directory right away. Urban is a clean and easy to use Directory and Listing WordPress Theme. The theme has many elegant features like keeping track of your listings, saved searches, claims, wishlist and flexible advanced search such according to tags, categories and amenities. The theme is fully responsive and easy to install and moreover it comes with 2 premium plugins (visual composer & revolution slider) for FREE. You can customize your own site using multiple layouts and show different contents based on numerous templates provided by this theme. UrbanGo WordPress theme is Translation Ready and compatible with WPML compatible, Contact Form 7 and WooCommerce. Nice post. Thanks for this great list of directory themes. Great list of directory themes.I was looking forward for a themes for my next project that is based on local community. I think my search over here as the list is going to gave me several idea and it will definitely save time. Cheers! I’m planning to create directory website and I’m looking below features for my next project. Any suggestion on this will be highly appreciated. 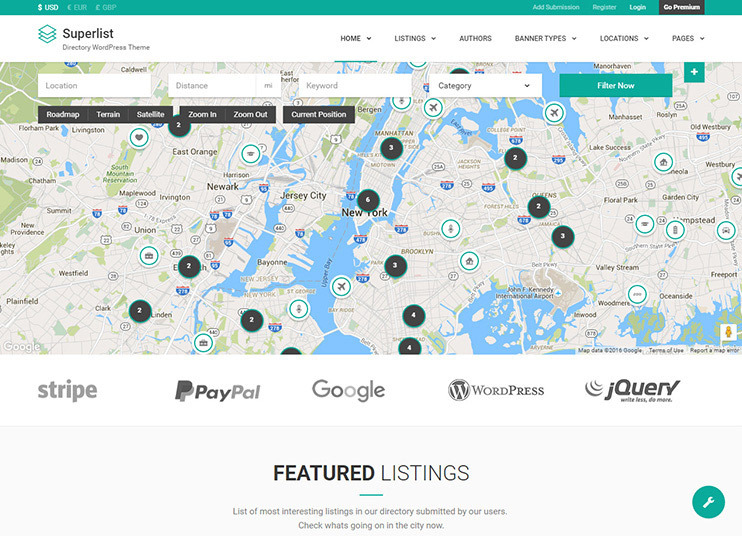 – Home Page with big slider/Map with search option in order to search for a listing. – Area for ads, rich text. – Standard Registration Process where individual have to pay for registration. The individual will be visible for a particular time period until the time period he has paid for. Once the payment is done the individual will be visible on the site and anyone looking for the service can find it. – A complete admin panel where admin can control all listings and registrations. Which theme according to you can handle this ? Almost all themes listed above have features you are looking for Homepage slider in option with homepage map, Advertisement area, option to allow free and paid registration. As a recommendation, I would like you to check out Listify and Directory which are great examples. Let me know if anything remains unclear. Themes are great. Thanks for sharing. Great collection of directory templates. It has helped me a lot to make the right decision. Thanks for sharing. Feel free to let me know If you need any sort of help to choose the right directory theme for your website. Is there any free directory template out there which have all the common features of a directory site? Currently, there is no such directory template available for free as it is not like a standard theme, directory themes require quality time to build with several features added to it. As per my opinion, I would suggest to stop your search for a free template and choose one which suits you the best in regards to functionality. As there is no much difference between themes so you can search for the functionality which meets your requirement rather than searching the best price. Great themes, Thank you for giving us such a useful information. Hi! I’m confused between Listify and Directory which will work best with large number of listings. In my research I found bot positive and negative for each. On the other hand, I’m running an e-commerce site which is based on Woocommerce so I’m well aware of using Woocommerce. So which theme is more customizable? Thanks for your feedback! As you are familiar with WooCommerce it would be great to choose Listify as you’ll get the familiar interface and you don’t need to learn completely new interface and functions. It will ultimately save lots of your time. Didn’t include Business Directory because it’s parent theme – The Directory WordPress Theme is already included. You can check out all the Directory Child themes alternatives here. All these themes inherit the features of the Directory WordPress theme and can be used for niche directory website development. Try the Directory WordPress Theme or the Directory Software to create an online directory. Both the options allow you to import data, offer free and premium listings, and create all the post types you want. Also, you can ad monetize, use Google AdSense or other advertising services. For coupons, you can use the Coupon manager and for reviews, you can use the reviews manager plugin. 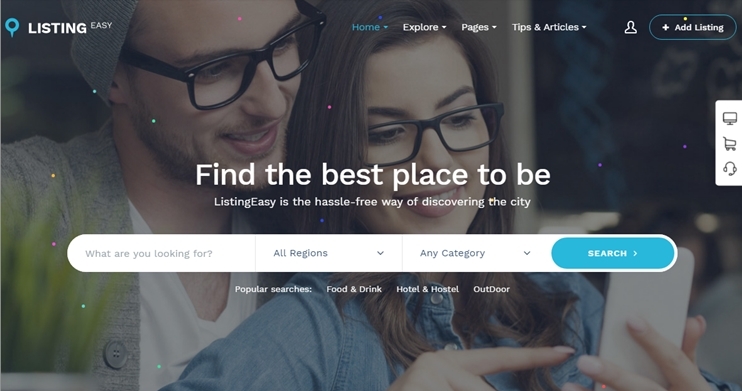 I am not sure if anyone has checked listingpro and mylisting on themeforest and have an opinion about it? Please advice as I am comparing listingpro vs mylisting vs templatic as my final choices.